This beautiful town home is in the last row of units that looks up into the hills and the Olympic Park ski jumps. It's a fully-furnished home with upgraded kitchen, slate flooring and high quality finishes. One king bed in the master suite, one queen bed in the middle bedroom, and a pair of bunk beds in the third bedroom. A separate fourth bedroom in the lower level has a queen bed and its own private bathroom with shower. Two queen inflatable mattresses can allow other guests to sleep comfortably. A mud room on the lower level keeps all boots away from the carpeted areas. A Bose surround-sound system and flat-screen TV make the living room a great entertainment area. A private hot tub on the deck allows for great views while you relax. Located 30-minutes from SLC airport, you can be here one hour from your plane's touchdown. Ample grocery stores (including Whole Foods Market), restaurants, other shopping and a movie theater are across the street at Redstone. Biking trails are all around. The Canyons resort is 5 minutes away, Park City Mountain Resort is 10 minutes, and Deer Valley is 15 minutes drive. Bus service and Uber/Lift provide easy transpo services. A pass card is provided to access the community's club house, with a game room, fitness center and an outdoor pool and spa (summer only). I'm a real estate developer based in San Francisco. We love PC and will make it our retirement home. We always keep the townhouse updated with tasteful furnishings and have added several upgrades over the years such as a water softener, new master shower, and air conditioning throughout. Our super property manager is always available for special requests or questions during your stay. PC is a lovely old mining / cowboy town with quick access from SLC. When your plane lands, you can pick up luggage and a rental car, and drive to the house - all in about one hour. Summer outdoor activities are as much fun as the winter sports. There is so much to do! This house is quiet and secluded, with great views of the foothills and the olympic training ski jumps. But it's still just a 2-minute drive to great restaurants, grocery stores, Walmart, Whole Foods Market, Tanger Outlet Mall, anything you need. Everything was perfect. We had four adults and four kids. Everyone had plenty of room to spread out, and large spaces to gather up for family fun. The unit was well equipped with everything we needed. We cooked-in most days. The large kitchen and grill on the porch were great. The unit came with movies and board games. The furnishings and beds were comfortable. The gas fireplace was nice. The garage and covered parking were great. Overall a great experience. We would definitely rent this unit again and recommend to others. Great set up with a master on the first floor and the 3 bedrooms including the other master bedroom. Work out great for the 8 of us to stay. One bedroom is bunk beds but w had 2 kids so they loved it. Easy to get to Canyons or other ski areas. Nice view up towards the Olympic Park. My wife said it was the best equipped kitchen we have seen and we use Home Away a couple times a year. Location would also be great for summer. What an awesome place to stay! Close to everything but still private. I'd stay there again in a heartbeat! We really enjoyed our stay in Bear Hollow. The community is well-situated (both to the mountain and to shopping) and the house was perfectly designed to accommodate two families. We enjoyed the kitchen and family room set up and appreciated the spread out bedroom/bathroom arrangements. The club house provided an excellent alternative for exercise when it was too cold to ski and the hot tub was a pleasure to return to, after a day out on the slopes. The property manager was quick to answer questions and concerns and we felt well taken care of. Perfect location and ample room for multiple families! We would definitely book again on our next trip to Park City! Perfect Location for Our Summer Trip! - Great Price for a Nice Big Condo! We had two families (four adults and four teenagers). This condo worked out great for us. I did a ton of internet-searching prior to booking this condo. And at least as far as I could find, this one gave us the best bang for our buck. Lots of space for a vacation condo! The layout allows for everyone to have some space so that we didn't feel like we were on top of each other all week. And we didn't even have to pull out the two air-mattresses. (But if you are bringing a couple more folks than we did, there are several places those would fit and not be in the way.) You can tell that all the rooms have been updated. Nice tile in the kitchen and bathrooms; new carpet, nice mattresses, etc.. Lots of seating space in the family room. Kitchen has easy seating for 9 (6 at the table, and 3 more at the breakfast bar that is adjacent to the table so that all can be involved in whatever you're discussing at meal-time!) But FYI... the layout incorporates lots of different stairs and landings. This was not a concern to us. But I do want to at least mention it for those that might be travelling with elderly relatives or someone with bad knees. If that is you, then this condo is probably not your best option. Our only real "complaint" (its really more of a note than a complaint) about this specific condo was that there really isn't much of a view from the front or back porch. But we weren't coming to Utah to "just sit around at the condo" so that didn't bother us. I only mention it so that if "awesome views from the porch" is something that you are specifically looking for, then this unit might not be your best option. 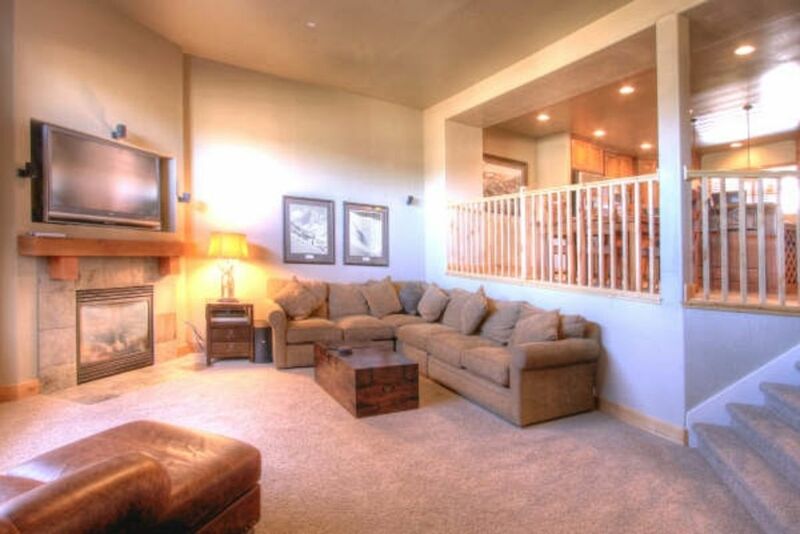 The Bear Hollow Village Clubhouse is just a 3 minute walk away. The clubhouse has a decent workout room, a swimming pool with lots of chase chairs, and a good sized hot tub. We were under 10 minutes away from just about everything we wanted to do and see. The Olympic Park is literally out the back door and straight up the mountain. Shopping, fast food, sit-down dining, the Canyons Resort, several hiking and biking trails, and Park City are all nearby. You can even rent and ride bikes to most of these places (in non-ski season). And within 30 minutes, you can get to just about all the other typical tourist spots in the mountains... as well as down in Salt Lake City. (We spent one day on jet-skis over at Jordanelle State Park... beautiful lake with great views!) I don't when just yet... but we will definitely come back!